This is an article I sent out to my subscribers earlier this week. They are in the money now so I am posting it here as well. Many of you know that I have been a paid consultant to Wavefront Energy and Environmental Services ( WEE.V) for some time now. I am a big believer in their Powerwave technology for enhanced oil recovery. This recently completed video shows how the Powerwave process works. Companies using this process include Halliburton, Encana, ARG Resources, PenGrowth, Energex, and a Top 5 global oil producer. However, the company that is currently the most leveraged to the application of Powerwave is Greentree Gas and Oil (GGO.V) in Ontario. Greentree's share price spiked to $0.78 the day after they jointly announced a partnership deal with Wavefront on the Rodney South field. Back on February 2, 2006, when the partnership was announced the price of oil closed at US$64.68. The price of oil on Monday's close was $93.98. The terms of the agreement included a capital commitment of $2.25 million from Wavefront for field development. This work included the drilling of 8 vertical injection wells straddling 2 horizontal producers. The Wavefront "pilot injection phase" will service/pressure approximately 60 acres of the 320 acre mapped extent of the Rodney South pool. 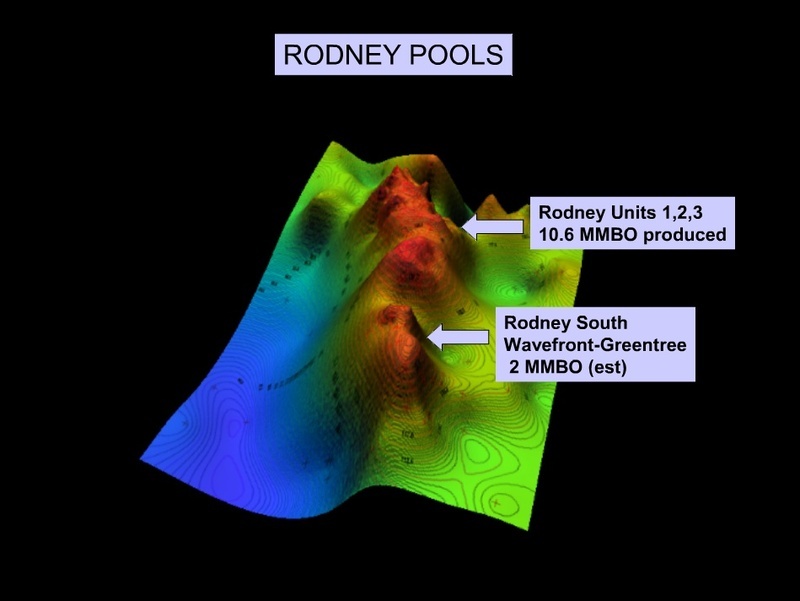 Internally generated reserve estimates for the pool include 3.65 MMStb in place with 1.33 MMStb recoverable and 2.0 MMStb potentially recoverable using Powerwave. The current market cap of ~$5 million might be reasonable for a company with ~115 boe/day of production in a fiscal regime where royalties are 12.5% however management has projected to exit 2007 with 200 boe/day. 3D view of Rodney Units 1,2,3 and Rodney South. A series of necessary steps to get the Rodney South field back on production included the unitization of the entire field and approval for the waterflood from the Ontario government. These activities took longer than expected and now Greentree shares are languishing near their 52 week low. Impatient investors have sold their shares and all the excitement of the Wavefront partnership has waned. In the meantime the price of oil has increased 45% and Powerwave systems are now installed at Rodney South. It will take some time for injected water to influence the horizontal producers but we would expect to see an announcement about production rates within 60-90 days. Directors and Officers hold approximately 25% of Greentree’s shares. Mr. Hamilton is a professional geologist with more than 25 years of experience in Western Canada and Northeastern North America. In 1994, he formed Hamilton Geological Services and has been consulting for Greentree since 1995. In 1996 Mr. Hamilton was appointed director and Executive Vice President of Exploration for Greentree and in 2001 assumed the position of President. From 1990 to 1994, Mr. Hamilton was a project geologist with Consumers Gas (Telesis Oil and Gas Ltd.) where he was responsible for projects in the northeastern U.S. and Ontario. Prior to that, he worked for Petro-Canada Resources and Shell Canada Resources in Calgary as a petroleum exploration geologist. Mr. Hamilton holds an Honours Bachelor of Science degree in Geology from the University of Western Ontario and a Masters degree in Earth Sciences from the University of Waterloo. He is a registered member of the Association of Professional Engineers, Geologists and Geophysicists of Alberta (P.Geol.) and the Professional Geoscientists of Ontario (P.Geo.). Mr. Hamilton is Vice President and director of the Ontario Petroleum Institute, a trustee of the Oil, Gas, Salt and Storage Trust Fund, a director of the Petroleum Human Resources Council of Canada and a member of the Canadian Society of Petroleum Geologists. Mr. O’Meara began his career with W.C. Pitfield & Company (now Dominion Securities) in 1962 as an investment advisor and became a senior partner of Davidson & Company in 1974. Davidson & Company was subsequently amalgamated with First Marathon Corp. Mr. O’Meara became president of Albert E. Harrison & Associates in 1977, a human resource recruiting firm specializing in the fields of sales and marketing. Mr. O’Meara founded Greentree Gas & Oil Ltd. in 1995, initially as a private operation and subsequently took the Company public in 1996 and was Chairman and C.E.O until 2004. Mr. O’Meara’s background in the brokerage business and human resources management has been instrumental in building a solid foundation and management team at Greentree. John had been involved in Ontario natural gas and oil production field operations for over 25 years with The Consumers Gas Company, Pembina Resources and most recently Talisman Energy prior to joining Greentree. Mr. Morse has been with Greentree since 2001. Mr. Sheldon is a securities lawyer with the law Firm of Sheldon Huxtable Professional Corporation in Toronto. He has been called to the bar in Ontario and Alberta. He has been practicing corporate and commercial law for over 30 years, with an emphasis on corporate finance and securities regulation, particularly in the mining and mineral exploration fields. He has appeared as counsel before numerous securities regulatory authorities, including the Ontario Securities Commission, British Columbia Securities Commission, Alberta Securities Commission and appeal panels of stock exchanges. For the past 20 years he has been a director and/or officer of other public companies listed on Canadian exchanges, including Multimedia Nova Corporation, and currently Metalcorp Limited, Greentree Gas & Oil Ltd., Cavell Energy Corporation, Vedron Gold Inc. and Wolfden Resources Inc.
Mr. Down is president of Down Farms and is a former Chairman of the National Salt & Water Conservation Program Committee for Ontario, Ontario Agricultural Research Coalition and The Commodity Council. Mr. Down has been a director of Greentree Gas & Oil Ltd. since 2000. Mr. Bean is the President of Gary Bean Securities Ltd. and he he has been a Director of Greentree since 2004. Now is the time to be getting excited about Greentree Oil and Gas. Probably the simplest reason is to look at management's cash flow projections. For 2008 they are projecting $0.19/share and for 2009 they are projecting $0.46/share. Junior oil and gas companies commonly trade at multiples ranging from 2 to 8 times cash flow. The projected production additions are based on a blend of success on a number of projects including shallow gas development (Norfolk), Rodney South, redevelopment of Rodney Unit 3, Trenton-Black River oil play in Essex & Kent Counties and the Trenton-Black River gas play in Nanticoke area (Stelco Steel properties now U.S. Steel). Management has other shallow oil plays on the books as well. Greentree has been ignored by investors lately but the pending Powerwave accelerated oil production from Rodney South, a solid inventory of oil and gas prospects, and the current low valuation (given projected production additions) make Greetree worthy of some serious attention. Greentree Gas & Oil Ltd. currently has a proposed private placement for $1.25-million consisting of up to 4,166,667 flow-through common shares at 15 cents per flow-through share and up to 5,681,818 units at 11 cents per unit, each unit consisting of one common share and one common share purchase warrant of Greentree. Each whole warrant issued will entitle the holder to purchase one common share of Greentree at a price of 16 cents for a period of 12 months from the date of issue. This newsletter is not intended to offer investment advice. Just because I write about an investment doesn't make it a good one. If an investment is outside your realm of knowledge, or doesn't fit your investment criteria, you should maintain discipline and pass on it, regardless of what the stock price has done. No mention of a particular security is a recommendation to buy, sell or hold that or any other security. Any advice is impersonal and not tailored to the investment needs of any specific person. Before buying or selling any stock you should consult with a qualified broker or other financial professional to solicit advice as to the suitability of a given investment. Greentree Gas and Oil has paid Big Picture Geoscience Inc. (BPG) $5,000 for the preparation and distribution of this report. BPG will also provide coverage of Greentree in its newsletter, The Big Picture Speculator, at a cost of $3,500 per month for a period of up to 12 months and the issuance of up to 100,000 options to acquire common shares of Greentree, exercisable for one year at $0.11 per share. Payment of BPG's compensation will depend upon Greentree reaching certain investment milestones in conjunction with the proposed $1,250,000 private placement being announced by Greentree contemporaneously with this announcement. BPG is also a consultant to Wavefront Energy and Environmental Services (WEE.V).